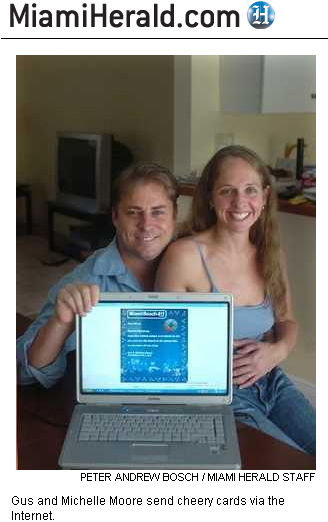 For Gus and Michelle Moore of Palmetto Bay, a husband and wife team of Internet entrepreneurs who operate the site MiamiBeach411.com, a green Christmas has been in the making for about seven years, and may have finally come to fruition for them on the World Wide Web. Michelle sheepishly admits that she has always kept on hand ‘‘five huge boxes of Christmas ornaments,’’ and even when she was broke, she’d spend every available penny on as many friends and family members as possible. ‘‘I guess as you get older, though, you realize that this isn’t what Christmas is all about,’’ she says. The tipping point for the couple came last week, as the couple watched the CNN/ YouTube debate for Republican presidential candidates. A question from a woman complaining about toys with lead, and other retail practices that could harm human health and the environment gave Gus and Michelle an epiphany. And with that they began sending electronic holiday cards to friends and relatives over the Internet. Michelle says the couple will expand on their conservation Christmas next year by either purchasing long-term growth savings bonds for nieces and nephews or opening savings accounts and contributing a little each year toward the kids’ college funds. I blame Scott. If it wasn’t for him asking where to find Christmas trees, nobody would be the wiser. "Gus and Michelle Moore Outed By Miami Herald"
Do you really think the cats will be going to college? LOL Doug- I don’t really think those are the kids she was referring to. ...oh…I like your hair Michelle! I guess you’re right, Suzy. Cats are too cool for school. Seriously, that really is a great shot of the two of you, Gus and Michelle! You should have it enlarged and hung on the boardroom wall one day.